I feel a morbid curiosity about depressed reader fervor for Fantastic Four comics, and contemporary story lines. Fantastic Four #75 was the first Marvel comic I read, when it was new. I was attracted to the red Kirby cover at the newsstand. The title always seemed off kilter after Kirby was gone. Archie Goodwin's issues captured the sensibilities of the Lee/Kirby comics. Roy Thomas' sci-fi stories in the mid '70s were interesting, and almost disorienting, with the deja vu artwork. Maybe Kirby's What If...? issue, with the Marvel Bullpen as the Fantastic Four, explains the decline. 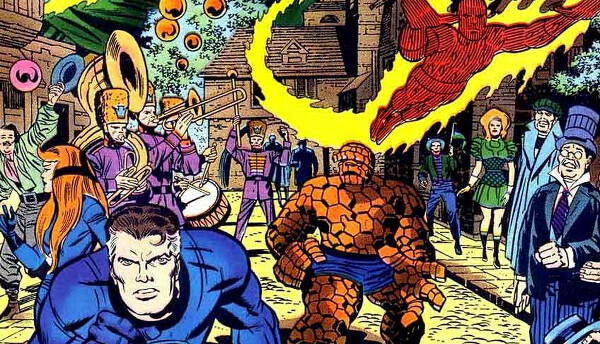 1960s Fantastic Four was the Silver Age of comics, and the book has been doomed ever since. Tom Spurgeon: I like a lot of the comics you mention, and additionally -- as I mentioned -- I like a lot of what they've done with the concept over the last five or six years. Strangely I tend to run super-cold on some of the stuff they've done during that time, too. It may be that Kirby's stamp was so strongly on that one comic above all others that it hasn't seemed right since, and that since we coordinate the Marvel Age Of Comics with Kirby, his departure meant that there wasn't an alternative version to gain credibility the same way that the Romita Sr.-era Spider-Man did. I don't know, it's all guess work.